An adequate equipment preventive maintenance program extends equipment useful life, prevents expensive repairs and eventually saves you a lot of money and headache. QR Mobile Data will help you keep accurate records of equipment service and maintenance, access critical information in the field and will notify you when next preventive maintenance is due. Smartphones and tablets have a lot of capabilities that are very useful for the field maintenance, service and repair work. Using a smartphone, field technicians can scan QR codes and barcodes, access information they need to do their job, record data, take photos, use voice recognition capabilities to create maintenance records, capture signatures and GPS location of the equipment. Smartphones are also compact and easy to carry around, unlike laptops and some mobile computers. No wonder that smartphones are quickly becoming the first tool of choice for the field service technicians. Using QR Mobile Data software and mobile application, your technicians will be able to use smartphones in the field to streamline their work, and office employees will be able to access and analyze data in real time using a web dashboard. Field technicians can record what was done during equipment service fast and error free using a smartphone and mobile forms. Create mobile forms that fit your business needs and workflow, update any time. Create custom mobile forms for recording equipment service, repairs and maintenance via a web dashboard. No matter what type of equipment you are servicing, you will be able to create mobile form(s) that fit your needs and business workflow. 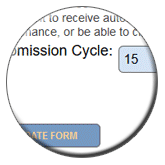 Link form(s) to the equipment group(s), or create form(s) valid for all types of equipment. If you are creating a form for preventive maintenance or routine equipment inspection, you can indicate how often this type of inspection / maintenance should be performed. If you do, you will be able to create reminders and receive alerts when next preventive maintenance / inspection is due. Optionally include clarifying text and / or images for the form fields, so that field technicians know exactly what to check. Include any number of image field(s). Field technicians will be able to use these fields to take photos illustrating the problem or what was done, and include them as a part of service / maintenance record. Add / update forms at any time, and your employees will always have current forms on their mobile devices. Optionally pre-fill part of the form in the office and push to the mobile devices. Give your employees a right tool to do their job. 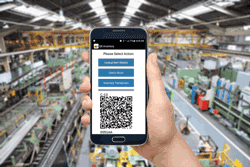 Field technicians can instantly access equipment information: specifications, instructions, documentation, recent service and repair records by scanning QR code / barcode label on the equipment with a smartphone. Create custom fields to hold equipment information that you want to access and track via a web dashboard. It can include anything you need, from warranty expiration to equipment specs, url(s) to pdf documentations, images and drawings, etc. Field technicians will be able to access this information, as well as recently submitted services, maintenance and repair records by scanning QR code / barcode label with a smartphone. Authorized users can update equipment information in the field, and / or take photos and add them to the equipment record. 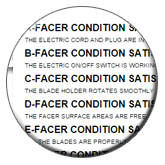 Keep accurate records of equipment service and maintenance. Make sure that authorized employees can access these records any time they need them, in the field and in the office. Scan QR code with a smartphone to access a list of mobile forms relevant to the scanned equipment. 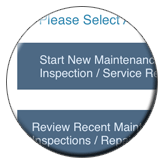 Select a form relevant to the task at hand (maintenance, service, routine inspection, etc.). Fill out the form on a smartphone. Take photos to illustrate the problem, what service or repairs were made, etc. and include image(s) as part of the service / maintenance record. Collect a signature if applicable. When maintenance or service record is completed, submit the form to a centralized cloud location. Submitted data are instantly available to all authorized users, in the field and in the office. Track time it took to work on the equipment. Submit time log with one click. GPS location of the equipment is captured automatically and is transmitted along with the completed form. Equipment service / maintenance can be recorded with or without data connection. If there is no data connection, field technician can submit completed form(s) and time log later, as soon as connection becomes available. Create PDF report on a smartphone, include images and signature. View, print and e-mail pdf report from a smartphone. Equipment maintenance records are stored in a secure cloud, can be accessed by authorized personnel in real time from anywhere. Office employees can access equipment maintenance, service and repair records via a web dashboard as soon as these records are submitted by the technician in the field. Search submitted records by various parameters (dates, location, equipment type, service type, etc.) to quickly find exactly what you need. Search by the data submitted in the form to find service records that fixed a specific problem, or pull out records that failed a test. View equipment locations on a map. Print and export maintenance and service records. Review service statistics, identify problem equipment (for example find equipment that required the most repairs during the last quarter). Create custom PDF reports based on your template. Review and download time logs and aggregated time report. Import time to your payroll / HR software. Extend equipment lifetime by maintaining a proper preventive maintenance schedule. Never miss a scheduled maintenance or inspection. 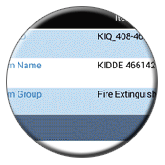 Configure custom reminders to alert you when next preventive maintenance, routine inspection or service is due. Specify how many days in advance you want to receive an alert. Create custom subject and text of the alert email message. Receive one reminder for all equipment due for the preventive maintenance on a specific date. 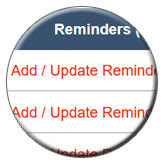 Configure similar reminders on the date custom fields. For example, you can get an alert when equipment warranty is about to expire.